Natalie and her siblings grew up as children of a Pastor, Bishop Nathaniel Simmons and learned about the Lord in a Christian home and supportive church family. The musical talents of Natalie and her brothers were helped in their development by participating in the church choir. As a young adult, Natalie Wilson received formal training at Church of Christ Bible School. She then made plans to begin a profession in cosmetology, treating her musical ability as a sideline for church performances, etc. Little did she know at the time what the Lord had planned for her life. The 19 member S.O.P. Chorale was formed at the St. Paul Church in South Orange, New Jersey, which was pastored by Natalie's late father, Bishop Nathaniel Simmons, under the direction of Natalie's brother, Glenn. In 1992, Glenn died in an accident, leaving the S.O.P. Chorale without a director. Natalie, who had been preparing for a career in cosmetology, found the very course of her life changed when her father asked her to take over as the S.O.P Chorale director. While she had never thought of becoming a choir director, and had a lot of doubt about her ability, she agreed to take over this new responsibility to keep the choir together as a group, until a "real" director could be found to take over. Natalie shares how she felt at the time. "I didn't know how to direct. The only skill I knowingly brought to the job was how to teach three-part harmony!" However, the Lord had other plans for her musical and spiritual gifts, and led her to develop her skills in singing, arranging music, and directing that He knew she had, to direct the S.O.P. Chorale, for His purpose and glory.. When the Lord calls human beings into a ministry, He is right there to help and enable them to grow in His ministry. Natalie comments, "God filled in the blanks, which gave me confirmation that it was meant to be. From the first day, the anointing was there, as if my brother's mantle had just fallen on me. Everyone was amazed, no one more so than me! The Holy Spirit just gave it to me, and still is helping me." With her doubts and reservations laid quickly to rest, Natalie stepped out in faith and took on her new role with "unrestrained joy and enthusiasm." She went back to school and became an ordained minister in the national Sounds of Praise ministry, while leading the S.O.P. Chorale, putting what she was learning to good use as she progressed in her studies. Natalie Wilson has had personal experience in receiving the Lord's peace, and healing, and joy during some rough trials of the heart, where she found herself in a mighty personal battle, on and off throughout the 1990s. During this challenging time in her life, when she was called into a music ministry with S.O.P, Natalie Wilson also had her own personal struggles as well with grief and turmoil. Within a few short years of each other, not only did her brother Glenn die, but also both her parents. On top of all this, her marriage fell apart, which pushed her into a battle with depression which she came through holding onto the Lord. Natalie reached a place in her being where she can truly say her pain and suffering has only made her stronger in her faith and her walk with Christ, inspiring many of the lyrics found in her songs which are so inspiring and uplifting to the listener. Wilson shares about her struggles. "I know the Lord has done far more than simply orchestrate my pain. These trials have all been monumental events in my life. They've been final tests before promotion from God. And He has brought me out in a big and amazing way!" Natalie shares her future goals in ministry: "No matter where my life goes from here, I would hope that people would always be able to say that I had been encouraging and uplifting to everyone I met and encountered, and that they felt the genuineness and sincerity of my spirit and heart." 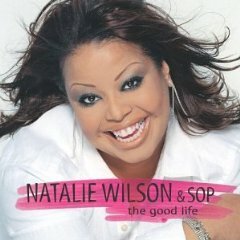 Natalie Wilson & S.O.P's first CD effort, GIRL DIRECTOR, a collection of Urban Gospel, with a street, edgy urban beat - Hip Hop style, touched many people, especially two songs, CALVARY and ACT LIKE YOU KNOW, which are called by some knowlegeable sources as being "modern Gospel staples." Interestingly, the independent record label which produced GIRL DIRECTOR went out of business in 1998 before the CD could be released by this company, but this didn't stop this group's music ministry for the Lord, because Natalie Wilson and S.O.P found their reputation growing and that their fan base kept getting bigger and bigger, encouraging them in their music ministry. Another phenomenon occurred, which had the Lord's hand on it. Despite having no marketing or promotion whatso ever for their debut CD, Deejays on local area Gospel music stations began to seek the CD out and bought it themselves. The single from GIRL DIRECTOR, "Your Heart," became a great regional success, and enjoyed a #1 spot for three months in Baltimore, Maryland. Natalie Wilson and S.O.P. again stepped out in faith and entered the touring circuit, performing in a steady stream of gigs around the United States and Canada. Their big break happened when they performed on a high profile, nationally syndicated show, "Bobby Jones Gospel Hour," and when they took part and performed with a full heart for the Lord during the yearly convention of Rev. James Cleveland's Gospel Music Workshop of America. When Natalie Wilson and S.O.P joined the Gospo Centric Records family, their debut CD was finally released in a full scale way, to the joy of their clamoring fans and admirers. As the Lord continued to guide them, as they depended on Him, it is not surprising then that Natalie and S.O.P. both grew and transformed together into a Gospel music entity with its own unique style and sound, which reflects the Lord's molding of their hearts and character, through His encouragement, leadership, and empowerment through the Holy Spirit. Because of this personal growth of both Natalie and the members of the S.O.P. Chorale, the music and lyrics on THE GOOD LIFE reflect a "deeper level of Praise and Worship and a ministering of healing and wholeness." Natalie shares how she has changed inside. "I've gone through several major transitional changes in my life in the last few years. It's as if another whole world has been opened up inside of me-- knowing who I am, being more confident in what God has called me to do, and just getting more comfortable in the skin that I'm in." Natalie also comments on the musical and character growth of the group, since their first Cd release, GIRL DIRECTOR. "I can see the Lord giving the group more discipline and focus, and a very clear direction since the first album of who we are, where we're going, and what we are to do. He has definitely refined us in that time, and we've become more polished in the sharing of the gifts He's given us." Besides having a large loving fan base, Natalie Wilson and S.O.P. Chorale have also been noticed and greatly appreciated by the Gospel music community as well. For their first CD release, GIRL DIERCTOR, the group received three 2002 Stellar Award nominations. Recently, Natalie Wilson joined the lineup of Gospo Centric artists slated to perform on "The Tonight Show with Jay Leno" on December 23rd, 2003. The show featured Kirk Franklin and friends, including Byron Cage, Dorinda Clark-Cole, and Percy Bady as well as new B-Rite Music recording artist and "American Idol" Wild Card RJ Helton. At the 2004 Stellar Awards in Houston, Texas, in honor of Kirk Franklin's induction into Stellar's Hall of Fame, Natalie Wilson and S.O.P. Chorale performed their song, "Free"and an ensemble group of 6 S.O.P. members sang "The Reason Why We Sing."